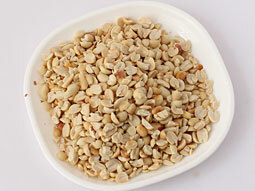 Peanut Chikki (Groundnut Chikki, Peanut Brittle) is a healthy, delicious traditional candy made from peanuts and jaggery. It can be eaten alone or with snacks and is a perfect replacement for chocolates. This recipe uses jaggery to make crispier chikkis in easier way. However, you can follow tips given below to make it with sugar as well. 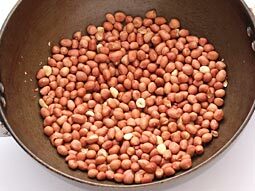 Roast peanuts in a pan (preferably heavy based pan) on medium flame for approx. 5-6 minutes. Stir constantly to prevent burning. Let roasted peanuts cool for 3-4 minutes. Remove its skin while they are little warm and break them into halves. 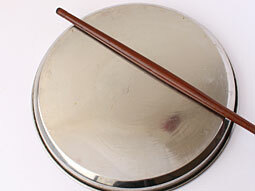 Grease surface of counter top or reverse side of a big plate and a rolling pin (belan) with ghee. Heat ghee in a heavy bottomed pan over low flame. Add jaggery and stir continuously on low to medium flame. When jaggery dissolves, stir and cook for approx. 4-5 minutes on low flame. 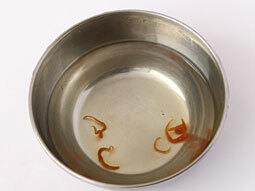 Check consistency of dissolved jaggery by dropping a small drop of it in a bowl filled with water. If jaggery drop turns into a solid drop and sits at the bottom of bowl, then it is cooked otherwise cook it for some more time and repeat the check. Turn off flame and add peanut halves. Mix until all peanut halves are coated with dissolved jaggery. Pour mixture over previously greased surface. Quickly roll the mixture flat using rolling pin. Keep it’s thickness around 1/3-inch. Make approx 2 inch apart parallel horizontal and vertical cuts with knife while spread is still hot. When cooled, break it into pieces and store in airtight container and enjoy it whenever you like. 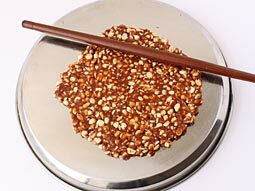 Follow steps given below to prepare chikki (brittle) with sugar. Follow the recipe from step-1 to step-3. 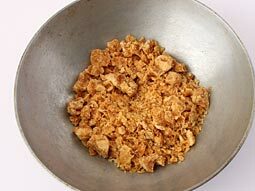 Replace jaggery with 1 cup sugar in step-4. Add and melt it in a heated ghee over low flame. When sugar dissolves and starts to turn light brown, turn off the flame and add roasted peanuts. Follow remaining steps (from step-7 to step-11) as given in the above recipe to prepare peanut sugar chikki. Color of peanut chikki depends on the jaggery. If you use golden brown jaggery then it will turn dark brown in color. If you like light brown color then use light yellow jaggery. Do not heat jaggery/sugar for a long time otherwise chikki will turn hard. Spread and roll out mixture on greased surface when it is hot. Once it cools down, it will be very difficult to roll it out. Replace roasted peanuts with roasted til (sesame seeds), dry fruits or roasted chana dal (daliya dal) to make til chikki, dry fruit chikki and roasted chana dal (daliya) chikki respectively. Serving Ideas: Groundnut chikki prepared with either sugar or jaggery is a great replacement of chocolates for kids and adults alike as it not only satisfies your sweet tooth but also provides proteins. Very nice, very detailed description. Thank you. Awesome only change is added 1 cup of jaggery for 1 cup peanuts. When I tried to roll the chikki I couldn't roll even I couldn't cut it out into pieces it broke automatically when tried to cut it. Plz tell me why? Response: Hello Taniya, it is necessary to roll and cut the chikki when the chikki mixture is still warm (not too hot nor cold). If it is not warm enough, it would be difficult to roll and cut the chikkis. Tried today it was awesome. Mixed groundnuts with almonds and cashews only problem was it was sticky not able to remove it, thanks for the recipe. During sankranthi / pongal we distribute ellu and bella mixture and sufficient quantity will be available back with us. I followed the same method but only change is instead of peanut alone the thil, fried gram are also added to this and came out well. Real replacement to chocolates for kid. My gur moongfali was crispy but sticking in mouth when eating what was the fault? Response: It happens when the gur/jaggery is not cooked enough. Nice recipe but my chikki is not crispy. It is very soft. What can I do? Response: The main reason behind soft chikki is uncooked jaggery/gur. When you try again, cook the jaggery perfectly as per the instructions given in the recipe to make crispy chikki. My chikki was good while preparation. However it stuck on plate. I have to crush it into small pieces. Response: Apply some oil on plate before rolling the chikkis to prevent sticking. You can also heat the plate from bottom (directly on gas flame) for few seconds to easily peel the chikkis. Awesome chikki... can't believe it is made by me....thanks to the receipe for perfect chikki. My peanut chikki was good brittle. After some days it became soft as I didn't store it in air tight box. Any idea to make them brittle again? Response: Hello Sangeeta, place the chikki in a baking tray in the oven and heat it for around 8-10 minutes at 350 F to get rid of the excess moisture. Did chikki for the first time, and they were perfect, crunchy but still not hard. Better than any store bought ones. Thanks for the recipe. My kids enjoyed it. My chikki was very soft. Can you please help me? Response: Hello Sarthak, it happens if the jaggery is not cooked enough. When you try this next time, cook the jaggery little longer. Which flavor adds in testy chikky? 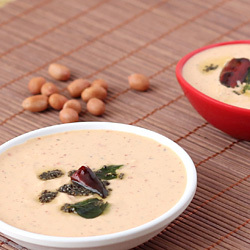 Response: You can add cardamom powder, rose petals, dry-fruits, daliya dal etc. to make different flavors of chikkis. I made chikki. The flavor came out amazing but after four to five minutes when I left it for cooling the chikki attained moisture and became really sticky. How can I avoid it if I want to keep it for over a month? Then again I tried with a mixture of sugar and jaggery and I wrapped it in foil paper and kept it in zip lock pouches. The sugar had melted out of its place and the jaggery was very sticky. What should I do? Response: Hello Janhavi, the soft chikkis means the sugar syrup/jaggery is not cooked enough. 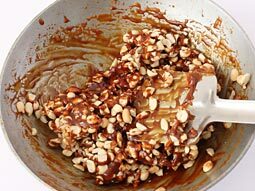 To prevent this, cook it little longer and check the consistency of cooked jaggery (as given in the method) before adding the peanuts. Hi, my chikki is so hard and it is very difficult to cut and eat. I have added more amount of jaggery and peanut is less. So what should I do to make it crispy and crunchy? Response: Hi Dharmendra, you can't do anything to improve the texture of chikki once it's done. I think the reason behind hard chikki is more jaggery compared to peanuts. When you try it next time, follow the recipe with exact given measurements. I tried this recipe. My chikki looks perfect but it is not crunchy as like market chikki. What should I do? Response: Hi Neetu, if the jaggery is not cooked enough, chikki turns less crunchy. Meri chikkki teeth me chipka rahi hai. Response: Hi Kiran, it happens if the jaggery is not cooked enough. Thanks for nice receipe. My question is if chikki becomes chewy and hard when cools down. I again heat it, it became soft but chewy. What can we do to correct it ? Shall I again heat the mixer? For how long? Response: Hi Neha, chikki turns hard and chewy if the jaggery is not cooked enough. It can be corrected by re-heating the mixture. Just cook it for a minute or two. If it is cooked longer, mixture may turn crumbly when cools down. Can I try this with crushed groundnuts as my kid is not yet used to chewing hard nuts? Response: Hi Laila, you can use semi crushed groundnuts but you cannot make this for your kid as the chikki has hard texture like nuts. Is it ok to use shakkar instead of jaggery? Response: Yes, you can make chikki with sugar. 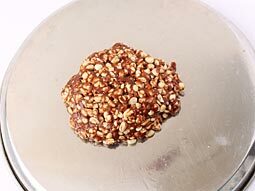 We have already posted how to make chikki with sugar in the same recipe. 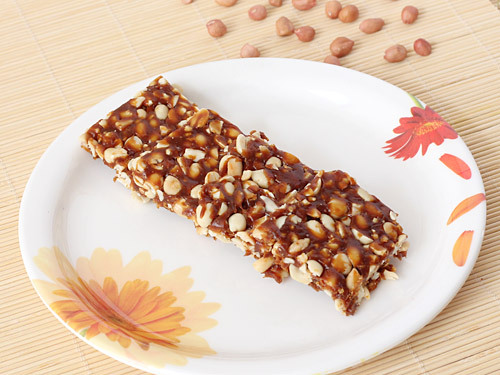 Read the instructions by following the link before making chikki. Hi I tried this, it tastes good but it has become very chewy. Also it's not coming off the greased plate. Should I cook it again? Response: Hi Ankita, thanks for trying the recipe. Chikki turns chewy if the jaggery is not cooked enough. Heat the bottom side of greased plate on stove for a minute to remove it easily from plate. Don't cook cooled chikki again because it may turn crumbly, if you cook it again. When you try it next time, cook the jaggery mixture little longer. Thanks to posting this recipe. I will definitely try this..
Hi, I would like to ask that if you make the brittle using sugar, do you need to add water as well? How long period can the brittle be stored without affecting the quality? Response: Hi Sajid, I have already posted about making brittle with sugar. You can read it here("how to make chikki with sugar"). You can store it up to 15-20 days in an airtight container at room temperature. My chiki became chew. Do I repeat this method? Will it turn crispy? Response: Hi Fariha, if you cook the jaggery for lesser time, chikki turns chewy because of the little moisture in the jaggery and if you cook jaggery for very long time then chikki turns hard. It happens generally in the monsoon season (more moisture in the air), you need to cook the jaggery for a little longer duration. Nicely described how to make. But the nutritious part is missing. Is it really good for health, or it harms? Response: Hi Roy, peanut chikki made with jaggery is good for health because it has two main ingredients peanut and jaggery, both are good for health. Peanut is a good source of carbohydrates, protein, calcium, magnesium and iron while jaggery is a good source of calcium, iron, potassium, magnesium and vitamin B1 and B2. I tried this recipe and it turned out very well. Easy recipe, good directions. Thank you! I made it with roasted skin on peanuts and roasted black sesame. Was delicious. I used a candy thermometer which is very useful for inexperienced cooks as well as experienced ones. I cooked the jaggery until 300 F and followed the directions. It was great. For other candy I make I heat the pan I\'ll be putting it is the oven heated to 250 F while the chikki is cooking. 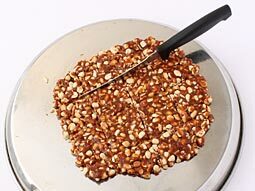 Take the pan out when chikki is ready to pour. It is easier to spread. Response: Hi Padma, thanks for sharing the info about how we can use candy thermometer to make chikki and also for the tip on how to roll it out easily. i want to know while cooking jaggery, should i add water or not? Response: Hi, you should not add water while cooking the jaggery. Stir and cook jaggery on low flame to get the perfect result. I tried this recipe it was just awesome in taste but it became hard on the surface. Response: Hi Mona, thanks for trying the recipe. 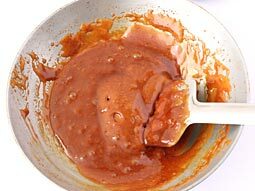 If you cook the jaggery for longer time, cooked mixture will turn hard in step-7. The mixture will turn hard within few minutes after cooking, so roll it as soon as possible (as rolling out the warm mixture is easier than cold mixture). Hey, I made it but it was not rolling out. It got stuck. Why? Response: Hi Doli, this could happen if the mixture has turned cold and is not warm enough. Make sure that you roll it out before mixture turns cold. Also make sure that you have greased the rolling pin and plate (or counter top) properly. Easy recipe ... I tried n got treat from my dad.. Response: Hi nupur, thanks for trying the recipe. You said your chikki turned very chewy and not hard after cooking, am I right? If jaggery is not cooked perfectly then this could happen. Did you check the consistency of jaggery (as shown in step-6)? Cook jaggery in a heavy based pan with continuous stirring over low flame and do not forget to check the consistency to get best result. Thanks for give me the correct recipe.